A rainbow of colors (green, yellow, orange, red, and blue) symbolizes the sign of the covenant appearing from a white cloud. Colorful letters form the word "Peace" and a Chi Rho (or Christ symbol). 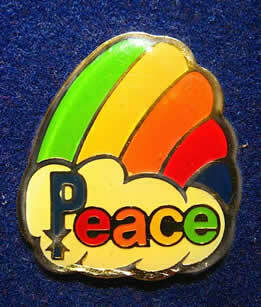 This pin (rainbow) is also the LOGO of JP II Reconciliation Resources.